Honda Motor Southern Africa puts high priority on the safety and quality of our products. 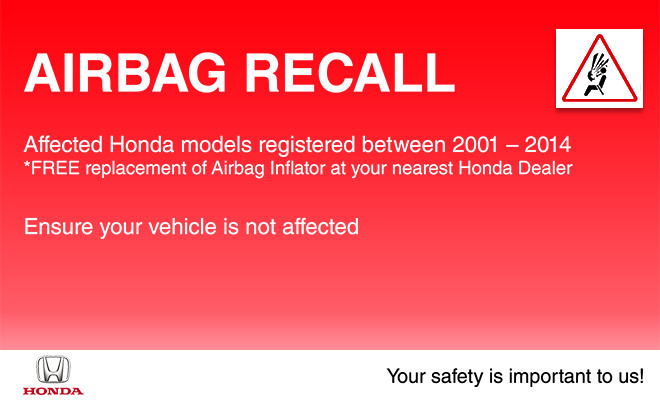 In-line with a Honda global direction, we have initiated a recall campaign to replace the driver and/or passenger airbag inflators fitted in some of the cars sold within the Southern African market. To date, no incidents involving defective inflators have been reported in the South African market. Please also note that there is no risk that the driver or passenger airbag fitted to your vehicle may deploy unintentionally and the concern may only be exhibited in the event that the vehicle is involved in an impact sufficient to deploy the vehicle's airbags.